The 40’s are gone – long live the 40’s! From their inception their distinctive shape and sound made the English Electric Type 4’s more acceptable to the average steam enthusiast than did most other classes of diesel. Based on the WCML and ECML as well as G.E.Metals with occasional forays into Southern and Western areas, the EE Type 4’s headed many of the crack expresses during the 1960’s. They took over from A3’s, A4’s, Britannias, Princesses and Coronations. Now they themselves have been superseded by the next generation of power in the shape of 47’s, HST’s, 56’s, 58’s, 60’s and electric power. Section 1:- Covers the wide ranging activities of the Class across the country on passenger and freight duties. Approximately 15 different locos are featured. Section 2:- A feature on 40 143 as she heads for Northwich off the main line at Hartford Junction with her load of tanks for the Winnington Branch. Having deposited these she immediately runs round and returns to the main line. Section 3:- On the Shrewsbury-Hereford line 3-4 times a week aggregates are collected in hopper wagons. This had been a Class 40 duty for some time and we see a number of locos active on this operation including the quite complex run-round procedure. Section 4:- A short section of 40’s working with other locos, with one or two quite dated scenes in evidence. Section 5:- The Final Hours. Class 40’s stacked up at Crewe in readiness for breaking up. Section 6:- Special workings including various tours from both on-train and lineside view points, featuring 40 106 in Green and D200 on her first run since being repainted in original colours. 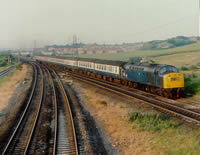 (By clicking here you are entering Wolverton Rail Videos web site with over 4000 transport videos & DVDs available. This entry was posted in Diesels & Electrics (heritage), Volumes 7-19 and tagged 1960, A3, A4, Crewe, diesel, ECML, electric, freight, Hereford, HST, lineside, Shrewsbury, steam, WCML. Bookmark the permalink.